On February 27, 1814, Beethoven premiered his Eighth Symphony – or, as he called it, “my little Symphony in F” – in Vienna. 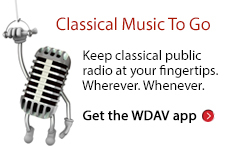 Now WDAV celebrates the “little Symphony” on the 200th anniversary of its debut. On February 27 at 2:00 p.m., tune into WDAV to hear host Matt Rogers play Beethoven’s Eighth Symphony in honor of the 200th anniversary of its premiere.